The third scene shows a race between a baby and a fat man. There is not so much news here. 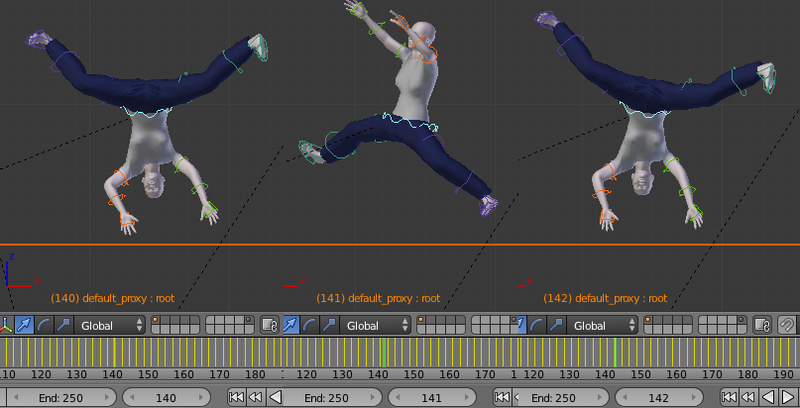 Import the two characters, load and retarget the bvh file, fix self-intersections, loop and repeat the animations, and keep feet on floor. An adult will rapidly outpace a baby, because the location F-curves are scaled with the size of the left thigh, which is bigger for an adult than for a child. Since we want the race to be even, we need to scale the F-curves in the time direction. This is done in the Global Edit section. Select any bone in the adult character, set the rescale factor, and press Rescale FCurves. The adult now runs slower. Repeat the process with the baby, but this time choose a rescale factor greater than one. The baby runs faster. 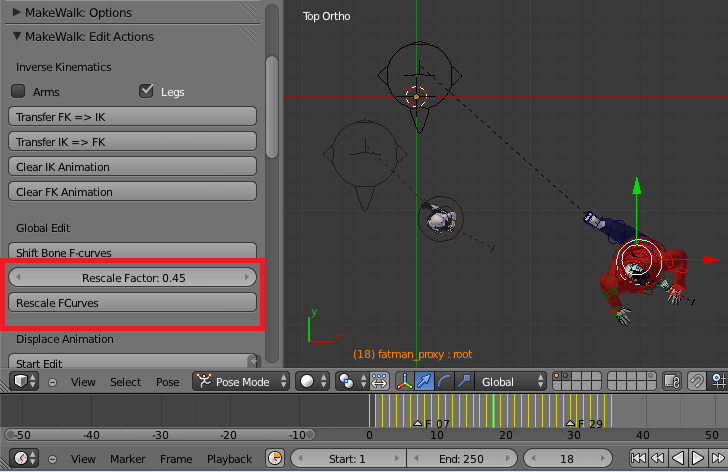 Instead of using the button in the Edit Action panel, we could simply have scaled the F-curves in the F-curve editor. This would work equally well for this animation. 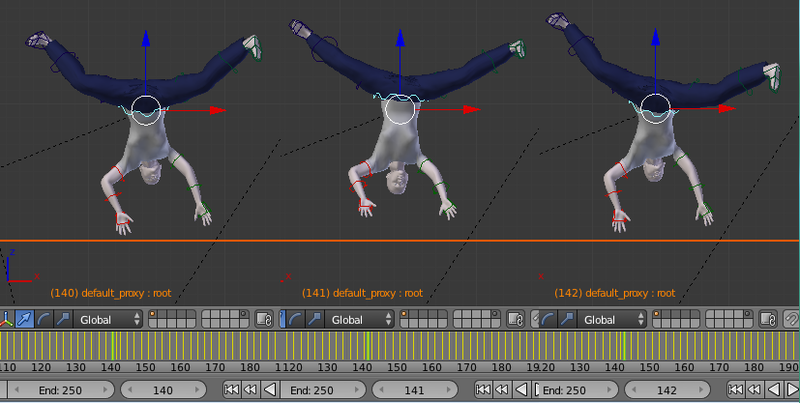 However, consider what happens with the cartwheel animation from ACCAD. Load and retarget the bvh file, and then scale up the F-curves with a factor two in the time direction. 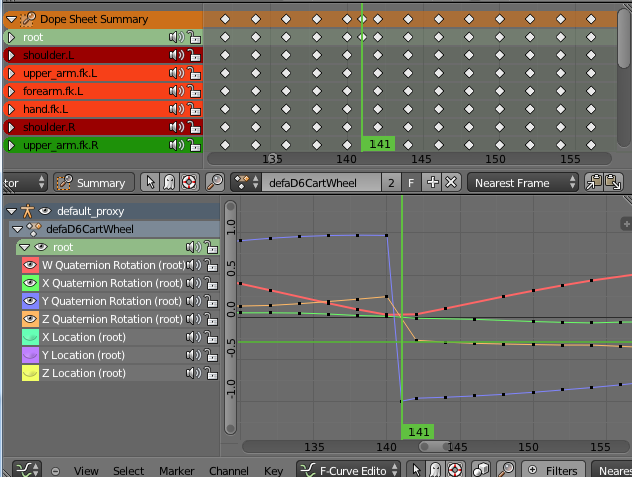 Between frames 140 and 142, something strange happens. 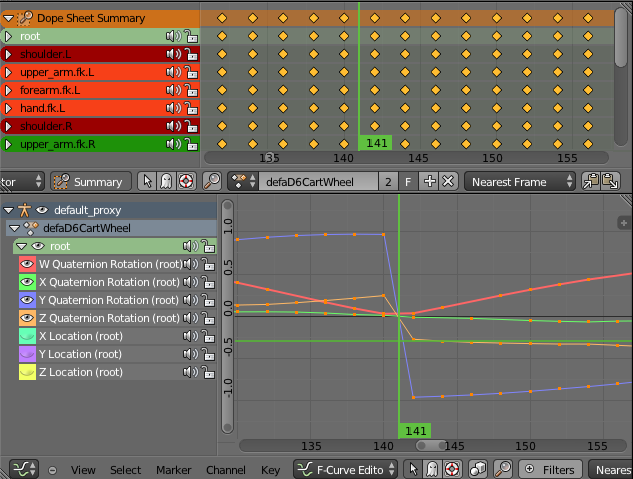 The reason is that the Y quaternion jumps from +1 to -1. There are two ways to represent the same rotation with quaternions (mathematically, SU(2) is the double cover of the rotation group SO(3)), and the rotations at frame 140 and 142 are almost the same, even though the quaternions are very different. However, the interpolated value at frame 141 is a completely different rotation, which is our problem. If we instead use the Rescale FCurves button with a rescale factor 2, an extra keyframe is inserted for the Y component at frame 141, making the interpolation better. Note that the Z component does not receive an extra keyframe. This is a bug, and it is visible in the picture above.